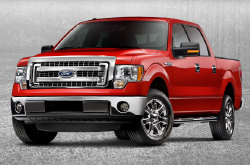 Peoria Ford invites Phoenix-area truck enthusiasts to check out the new 2013 Ford F-150. A time-honored favorite in Arizona, F-150 provides best-in-class 11,300-pound towing capacity and 3,120-pound payload delivery. Ford combines economy with performance in F-150's EcoBoost® engine, which utilizes twin-independent variable cam timing (Ti-VCT) to produce a remarkable 17/23 mpg rating. Various seating options and Ford's advanced safety technology make this truck a great choice for work or play. With a selection of ten different models, there's a Ford F-150 for everyone! The F-150 XLT has four engine options while other models offer luxury features like heated and cooled power seats. That's right Phoenix shoppers cooled seats! Take a little time to go over the information below in our Ford F-150 review below. Compare the 2013 Ford F-150 next to vehicles like the 2013 Toyota Tundra, Chevrolet Silverado, Dodge Ram and the Nissan Titan, and you'll spot that the F-150 scores higher the competition in several areas. Look over our Quick List below to find out why! Like the F-150? Get a quote on your trade-in and save! Your Ford deserves to be treated correctly - that means Ford factory- trained F-150 technicians, the joy that comes from a 1 year service work warranty and real Ford F-150 parts. Peoria Ford service and Ford repair in Phoenix is a double click away! Turn to the auto repair hot shots in Phoenix, Peoria Ford, when your Fords takes a thrashing. We work on a multitude of jobs: from heavy, time consuming endeavors like electronics maintenance to manageable stuff like timing belt replacement and routine inspections. It's very simple: If you want hot shots service and cheap repair prices in Phoenix, make Peoria Ford your first stop for Ford vehicle maintenance. Find out how much you can save on your next service! Just follow the link below. 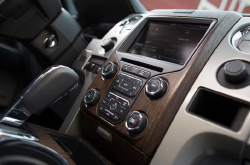 After reviewing the above material on the 2013 Ford F-150, Phoenix shoppers need to make serious choices between models, cab styles and options. Ford F-150 models also come with varying box sizes and engines to consider. Engine choices range from a 3.7-liter V6 to a 6.2-liter V8, with certain models offering Ford's EcoBoost® option in a 3.5-liter V6 for even better fuel efficiency. Option packages include high-technology convenience features like remote keyless entry, power sliding rear windows and reverse sensing systems. Rear view cameras enhance safety and make trailer hitching easier. Peoria Ford's caring staff is ready to assist in matching the best model and option combination to your lifestyle. Whether you're transporting tools and equipment to a jobsite or hauling horses to West World, F-150 does the job safely and reliably. Ford's Trailer Sway Control (TSC) is a standard F-150 feature, which, in addition to the AdvanceTrac® with Roll Stability Control™ (RSC®) system, helps maintain trailer control by automatically utilizing braking and engine power systems. In choosing Ford F-150, you can be assured you're getting best-in-class towing and payload abilities and fuel-saving performance. Visit Peoria Ford and try out a 2013 Ford F-150 today!